If ever you wish to experience wild beauty, endless surreal sandscapes, and a brooding, mysterious coastline, you don’t need to venture very far. Sure, you could book a rocket ticket to the moon, or you could just take a drive up Namibia’s ribboning Skeleton Coast. Twisted ships with broken backs crumbling to rusted dust, bleached whale and seal bones splintered and strewn on the beaches, tangled oil drilling equipment that’s slowly being swallowed by sand, and not a living soul in sight – these are facets of the Skeleton Coast that give it its unique atmosphere and surreal beauty. A vast shard of desolate coastline, stretching from the Ugab River in the south 500km to the Kunene River bordering Angola in the north, Namibia’s Skeleton Coast is a place of solitude that will leave you breathless with wonder. Those uncomfortable with quiet may suffer a little distress at the vastness and silence of the place, the ethereal landscape and endless swathes of sand. They may even hasten to get out and away, back to ‘civilization’ in Swakopmund, only to realise in retrospect how rare and moving it is to be completely alone, when all around the world heaves with noise and chaos. Well, so it was for me the first time I ever visited the Skeleton Coast – it was much more enjoyable in retrospect. Now, it’s one of my favourite places on the planet, and the closest you’ll get to stepping onto the moon without leaving earth. Still driving cocooned in fog that casts a blinding white glare, we pull off the road to marvel at a vast lichen field in fifty shades of green. Fog is an elixir for lichen. The tiny, delicate, prehistoric looking plants soak up the moisture which sustains them. But even if they turn crispy brown from dehydration, just a little water will have them flashing green leaves in no time. Lichen is an expert desert survivor and a renowned indicator of pure air, so we know there’s plenty of that here. 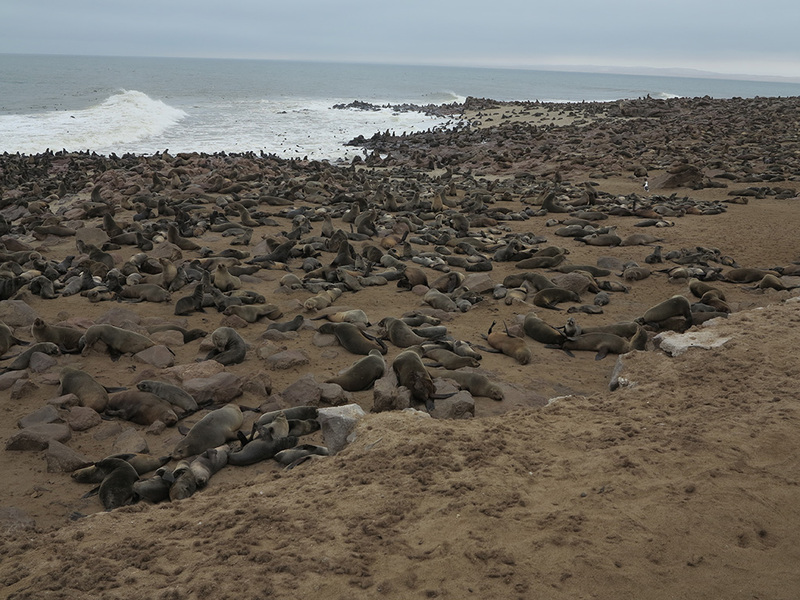 Further along, on the sea side of the salt road, is a heaving mass of fur-coated blubber at Cape Cross. Intrepid Portuguese navigator, Diego Cão, landed here in 1486 while searching for a sea route to the Far East. Proud to had made it this far down the west coast of Africa he planted a stone cross, which stood proudly until the late 1890s but now lives safely in the Oceanographical Museum in Berlin. A replica took its place, and seems to watch protectively over the vast colony of Cape fur seals that lives here. Is it a stone, is it a seal? Sometimes it’s hard to tell with over 200 000 seals draping themselves over rocks as well as each other. It’s only when they move or grunt that you know for sure which is which. 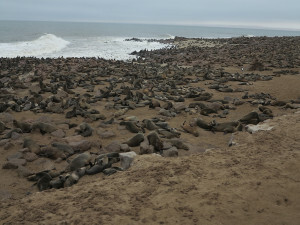 The sea is boiling with seals too, swimming and diving, and the coastline is carpeted in them. A walkway allows close access to the colony which seems to do little more than eat, sleep and breed. It’s a coveted life. Leaving Cape Cross, headed to Torra Bay, we pass rickety roadside stands laden with pink salt crystals. “They’re for sale,” says Brian, “you simply take what you want and leave the money behind. The sellers will come and collect it at the end of the day.” Just where these sellers come from is anyone’s guess, as there’s nobody in sight. They too seem to appear and vanish like the fog which blankets the coast all year and can even hide whole shipwrecks from plain sight. 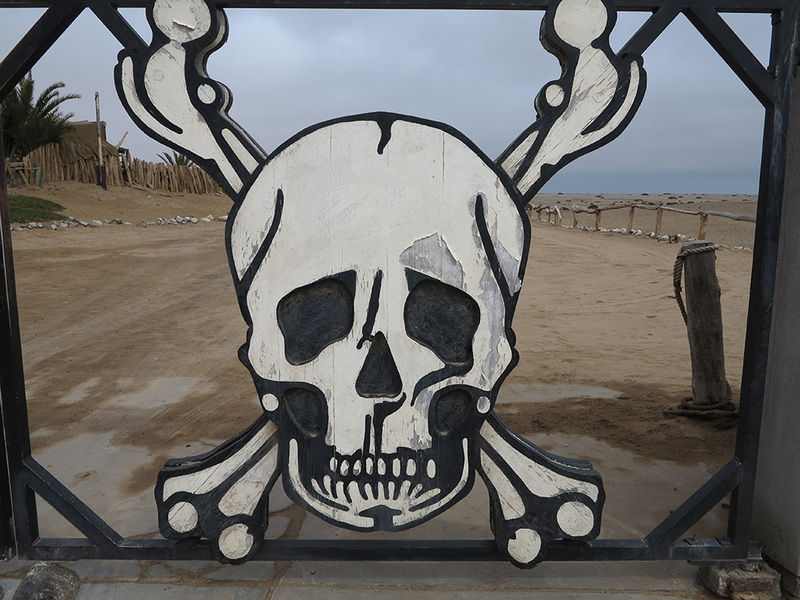 Two skulls standing as tall as a man are the welcome to the Skeleton Coast Park. “This is it,” smiles Brian, as we hop out of the vehicle to sign in at the park gate. Makeshift, tiered wooden tables outside the little park office are encrusted with assorted rocks and desert roses collected for sale, and again there’s nobody to accept your money. Eventually, from over the fence a sleepy head appears, so I can leave with a stony desert rose to take home. Now officially inside the Skeleton Coast Park, the road ahead is still straight and monotone. It’s sometimes difficult to see where the road sides are exactly, as they blend seamlessly into the surrounding sand. “Welcome to the moon,” mutters Brian to himself, focusing intently on the road ahead, and sometimes squinting to distinguish it from the surrounding sand. We snack on wasabi coated peanuts to keep alert, as the sea of beige sand we are crossing is surprisingly hypnotic. Today, the wreck of the Southern Cross can just be seen through the cool fog curtain. 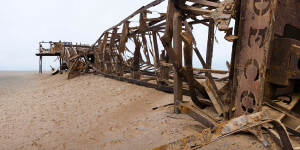 It’s 15km into the Skeleton Coast Park, and the rusted wreck is awash with icy white water giving it a ghostly presence. Then 25km further is a wreck of a different kind. Here lies what remains of Ben du Preez’s and Jack Scott’s big dream. They’d already tried their hand at diamond mining, and they firmly believed oil lay beneath the sands of the Skeleton Coast. It was their big hope for fortune. They drilled more than a kilometre into the earth but found only anthracite, so they abandoned hope, packed up and left. 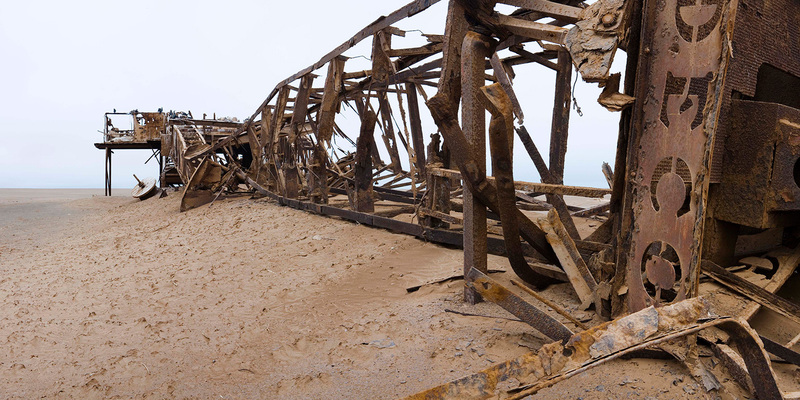 Their rusty oil rig is slowly and silently being reduced to dust in the desert – a skeleton of a different kind – watched over by brown hyenas and Cape cormorants. Down the road the sand adds black to its colour pallet of beige and cream, and the landscape appears to have been sprinkled from above with fine black stones. These gravel plains are extremely fragile and vehicle tracks across them stay visible for over a century. There is not a sign of life anywhere now, and we stop to breathe in the stillness. It’s so quiet you can hear your heart beat, and your inner thoughts are noisy. You want to hold your breath for even that breaks the perfect silence. Such stillness is the soul of the Skeleton Coast. Through Torra Bay, a small collection of simple houses used mostly by fishermen and holiday makers, the road continues straight and the salt surface turns to gravel. If the road takes just the slightest bend, a road sign warns you. But there was no warning at all for the bizarre, most unexpected sight that unfolded before us at the Uniab River. 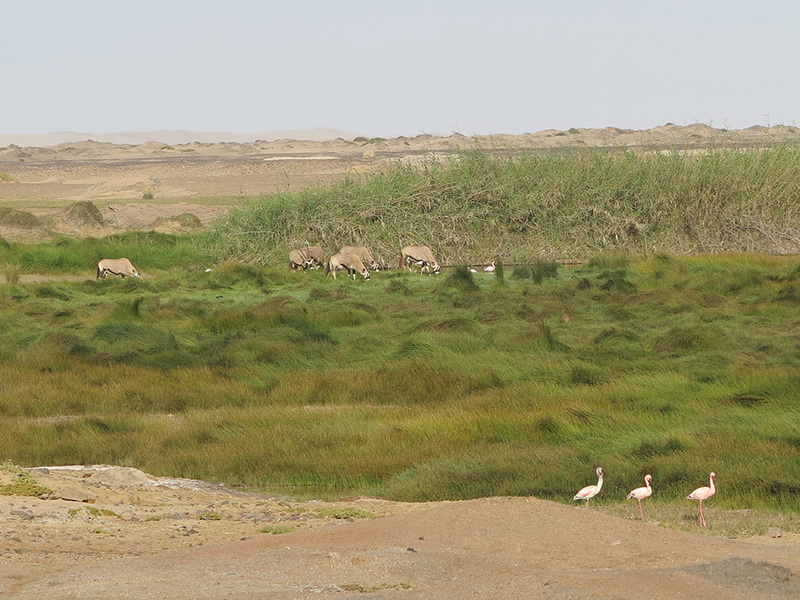 For hundreds of kilometres we’ve driven across a sheet of monotone sand – but for some shaded black – and now before us is an tiny oasis of green in the desert. 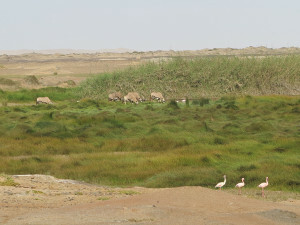 Not just water, surrounded by lush vegetation, but pink flamingos high stepping through the pool and gemsbok grazing oblivious to anything around them. Simultaneously we burst out laughing at the sight and stop to admire it. It’s the only natural punctuation mark we’ve seen along the road since entering the park; a little haven of life and colour surrounded by desolation. Then as he finishes speaking a splinter of sunlight pierces the fog layer and shines on our cottage for just a minute, as if to prove Brian wrong. Then it’s gone again, and our focus in on warming up against from the biting Atlantic breeze. Gloves and beanies on, we dine on freshly caught pan fried cob and talk about wrecks and skeletons of different kinds. There is nowhere else I’d rather be. 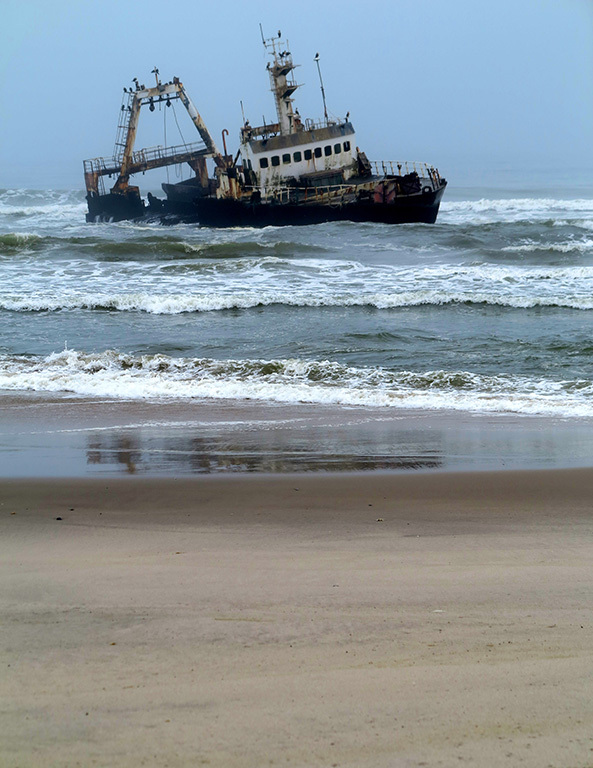 Kissed by cold fog and with sand in my shoes, the Skeleton Coast is like touching the moon. 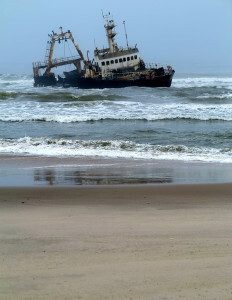 I have just re-read your amazing article on the Skeleton Coast Keri, it is absolutely fascinating! I could almost smell the sea and taste the salt on my lips, feel the icy Atlantic breeze whilst embracing the solitude and desolation you so evocatively describe. Delicious pan fried cod goes extremely well with talk of shipwrecks and skeletons, perhaps even with a nice glass of wine or two! I felt quite envious. You are so eloquent and I have absolutely no doubt, whatsoever, that you hold your audience in the palm of your hand completely spellbound! I look forward to ‘living and drawing in’ more of your fascinating experiences!